James Bond had an Aston Martin DB5, suits from Saville Row and his trusty Walther PPK. John Steed, from ‘The Avengers’ preferred the Bentley, bowler and sword-stick. Even Austin Powers had a Jaguar E-type. I was finding it difficult to maintain my ‘International Man of Mystery’ image in my birding silks, riding a Mary Poppins bike that I had borrowed from the hotel. Matheson Hammock was 5 miles away. No public bus served the route, taxis are unreliable for return and ‘Q’ has been spending so much time trying to fix my lens, that he forgot to send the hoverscooter. So a bicycle was the most practical solution, although I had hoped for one that would allow me to retain a bit of dignity and sexual credibility. In my line of work where image will always take second place to practicality, I cut a fine dash as I passed some of my more flamboyant and outrageous colleagues on their way to…, well I’m not sure what they were going to do. They did tell me.., but I can’t have heard them correctly. They called out and asked if I wanted a bit of Ruff. When I turned them down, they suggested Brambling (they were very knowledgeable about birds, considering). Having never brambled before, I wasn’t sure what to expect, but it was quite fun (imagine Dunlin‘, but not in the dunny). I had been on an unproductive visit to Snapper Creek in the evening when I rode past my colleagues looking like Julie Andrews on patrol. The small river is very close to Best Buy. I had been promising myself a bridge camera for some time and since my lens may be out of action for a while, now seemed like a good time. I plumped for the Nikon P100. Fully charged and with the instruction manual briefly glanced at, I set out into the darkness of the next morning, heading for Google Earth ref; 25° 40′ 35″N, 80° 15’ 45″W. The ride only took about 20 minutes on good flat roads, but the traffic was quite heavy on Old Cutler Road as I approached Matheson Hammock (for the benefit of my colleagues who may like to try this, the bikes do not have lights, so make your own arrangements if you are setting out early or returning late). The picnic area to the right of the entrance is my favourite place to start. There were Palm Warblers on the ground and a couple of Black-throated Blue Warblers in the trees. 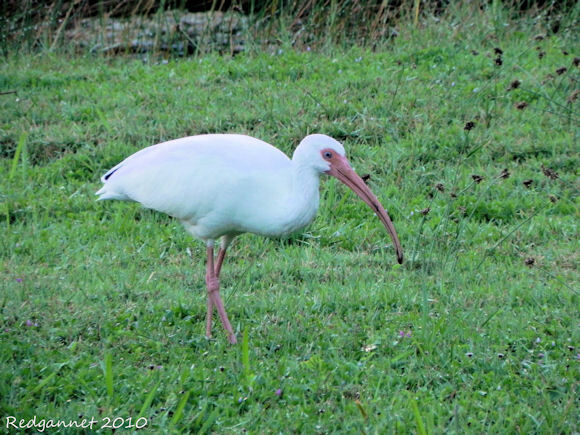 On the grass close to a lake were three White Ibis, probing the soft ground. 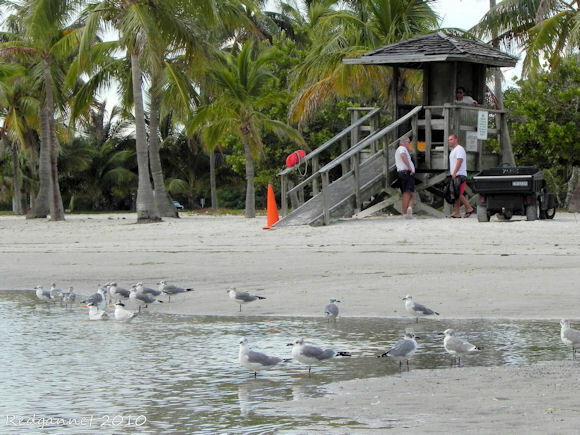 If you are planning to visit Matheson Hammock and hope to do so either early in the morning or later in the evening, bring insect repellent. Bring the strong stuff. The tiny biters were very irritating this morning despite frequent applications. Once the sun came up, they moved into the shade of the trees and the rest of the day was pleasantly insect-free. The camera took a long time to warm up this morning. The air was warm and humid and the condensation kept forming on the glass that had been chilled in an air-conditioned room overnight. Note to self; next time, take out binoculars and wear them during the ride to give them a chance to acclimatise. Other birds around the picnic area included Blue-gray Gnatcatcher, Red-bellied Woodpecker, Yellow-bellied Sapsucker and Gray Catbird. 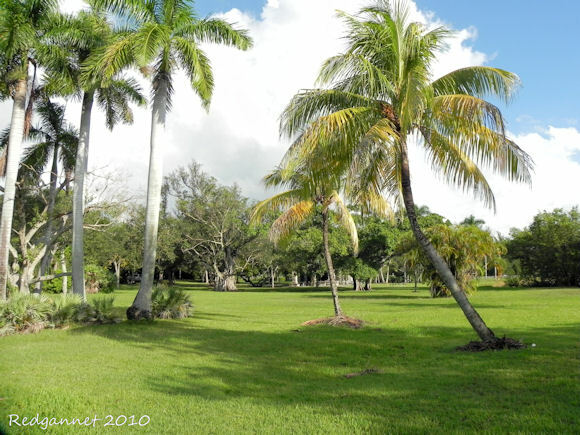 The entrance to Fairchild Tropical Gardens is just beyond the picnic tables. I was attracted by a sharp “chyut.” in a small tree. I couldn’t see anything, so I hazarded a pish which produced a movement, but the bird remained in cover. I waited for a moment and pished again. This time the bird came out for a better look and I recognised the black streaking on the flanks, the black markings on the face and coloured throat of a Yellow-throated Warbler. 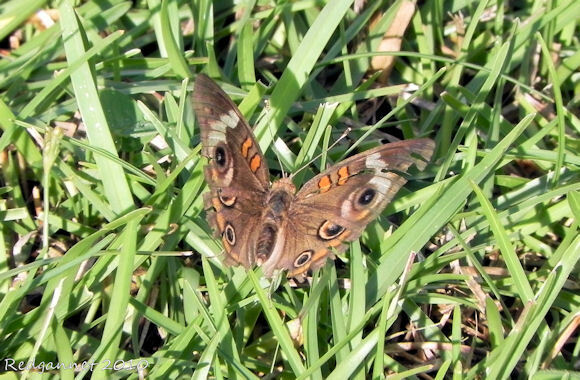 I had never seen one before, but had passed over its image dozens of times as I scanned field guides to identify one of its Dendroica cousins. 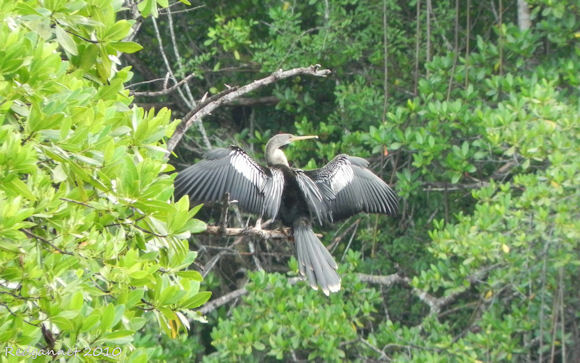 An Anhinga was perched with its wings spread on a branch over the lake. The camera did not like to focus on the bird, but preferred the bushes beyond. I had to rely on manual focus to get a picture. A similar problem occurred when I tried to take pictures of birds in amongst foliage, but I wasn’t quick enough to switch to manual focus for the Prairie Warbler or the Northern Cardinal. Back at the entrance, I headed along the road, through the mangroves, to the shore. The road forks right towards the marina across the creek. The left fork leads to a large car park which looks out across a shallow bay and serves a water sports area and a lagoon beach. The weather was threatening and it looked as if it might rain at any moment. 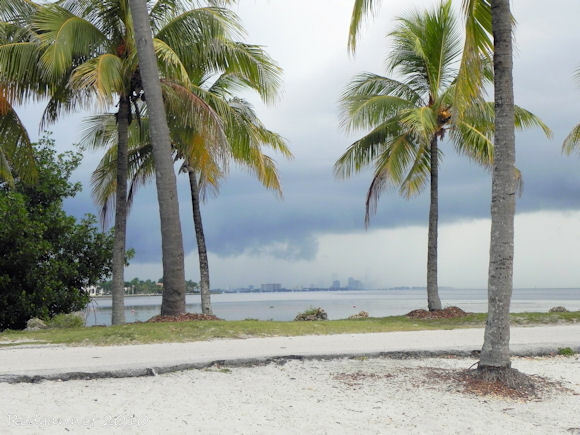 Downtown Miami, in the distance to the north, looked as if it had displeased the Gods. As the tide drops, beds of sea grass are exposed and this area is popular with herons. 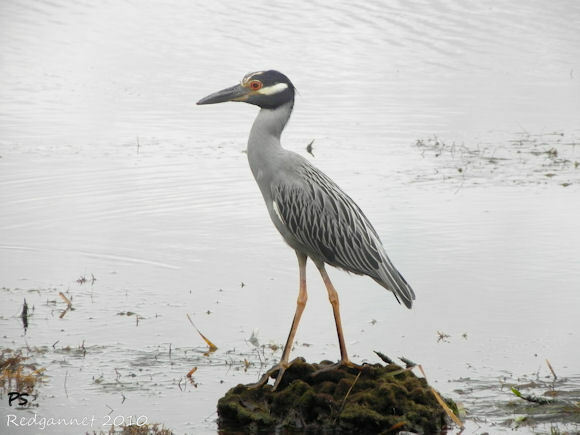 Great Blue and Little Blue Herons, Great Egrets and a Yellow-crowned Night Heron were hunting close to shore when I arrived and ventured further out as the water became shallower. An artificial lagoon is usually a popular place for local sun and sand enthusiasts. There were a couple of diehards there today despite the leaden skies. A pair of Laughing Gulls in flight caught a stray sunbeam which threw their eye rings into stark contrast with the darkness of the approaching rain. A flock on the lagoon were mostly Laughing Gulls, but one Herring Gull and a couple of Royal Terns were mixed in with them. I had to take a close look at the flock. 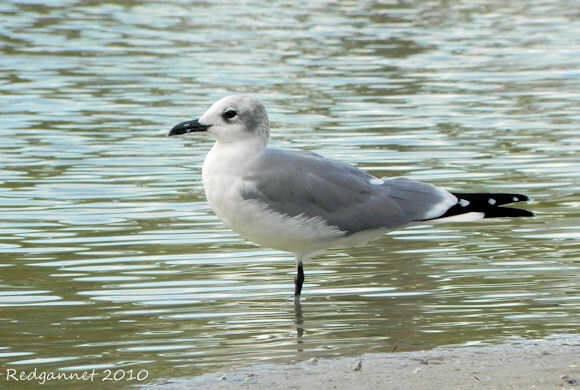 The Laughing Gulls appeared to be of assorted sizes and I was hoping to tease a Franklin’s Gull out one of the smaller ones, but I couldn’t. The lagoon has been constructed as a circular pond. There is a beach and a couple of lifeguard stations. A path runs around the outside and is washed by the inshore waters of the ocean. It has a couple of inlets that allow the pond to be flushed by each high tide. 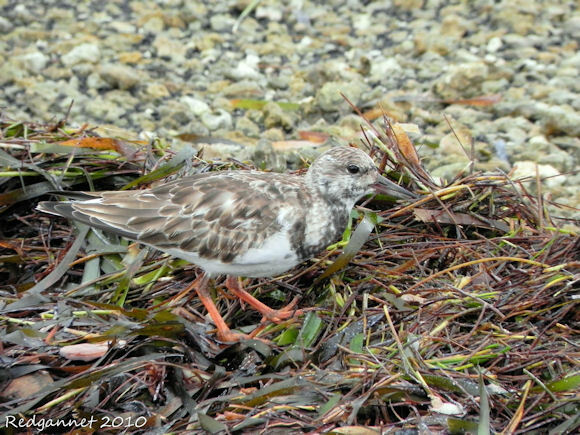 A small group of Ruddy Turnstones were feeding on the ocean side of the path. 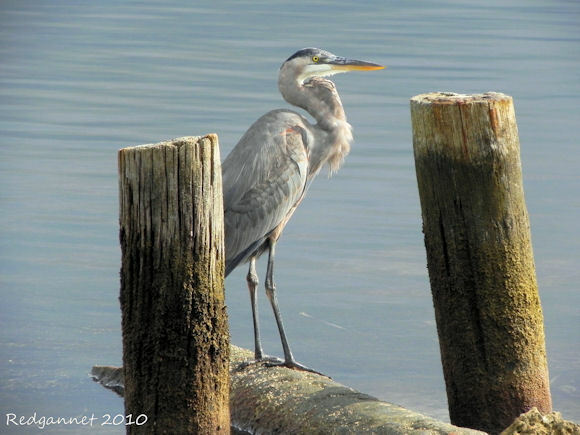 The wings-out stance that they adopt when perched is called the horaltic pose. 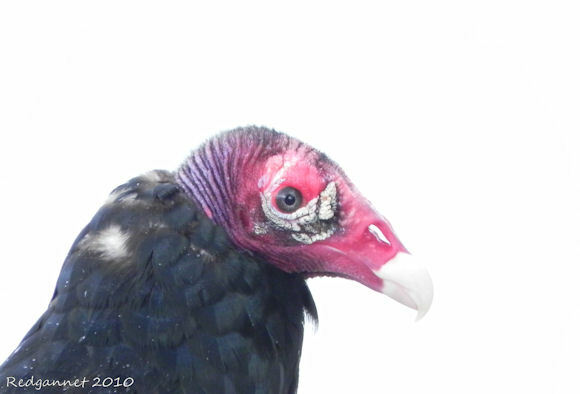 I have found the term used frequently in reference to Turkey Vultures, but not to any other bird. Does it also apply to cormorants and other birds that extend their wings in a similar pose? These facts come courtesy of various sites that I was searching through as I tried to find out about the light coloured growths on Turkey Vultures’ faces. I don’t know if they are caused by bacteria blooms or are they perhaps lappets? A sudden wind heralded the imminent arrival of the rain. The Turkey Vultures on the ground beyond the lagoon spread their wings to greet it and lifted into the air without a single flap between them. The only place to shelter from the downpour was the mens’ changing room. I felt a bit conspicuous standing in the doorway with my cissie bike, so I whistled a few lively show tunes to keep my spirits up. Once the rain cleared, I took a last turn around the car park looking out across the grass beds. A distant Osprey was hopefully trailing its feet through the water as it flew out to a post in the middle of the bay. Some more Ruddy Turnstones were picking through washed up weed while a Willet bathed by the waterline. On the way home a small Buteo caught my attention. It was clinging to the spike growing from the top of a palm. 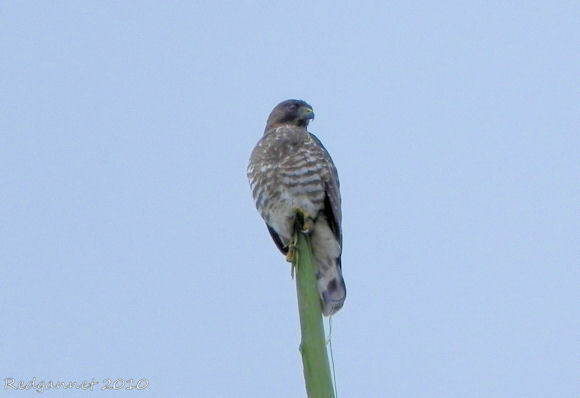 It was smaller and the breast was more heavily marked than the Red-tailed Hawks that I commonly see. Comparing the photo to a field guide, I believe it to be a Broad-winged Hawk, which would make it my second lifer for the day. To present a more holistic impression of Matheson Hammock it would be as well to include a few comments about other creatures apart from birds that were seen this morning. 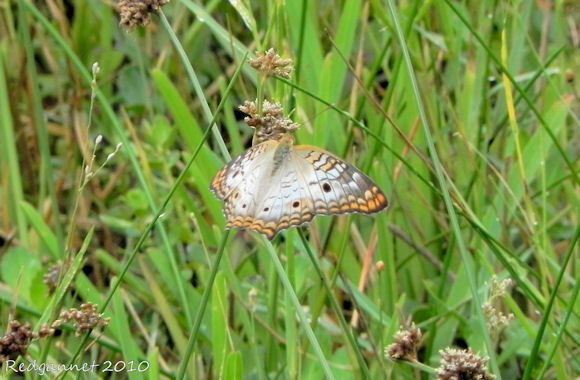 There were a few butterflies around including the ones pictured here. There were moths too, but if I were to start taking pictures of moths, I wouldn’t have to go beyond my own wallet and wardrobe. There were lots of lizards that scurried away through the rustling undergrowth before I could get a look at them. 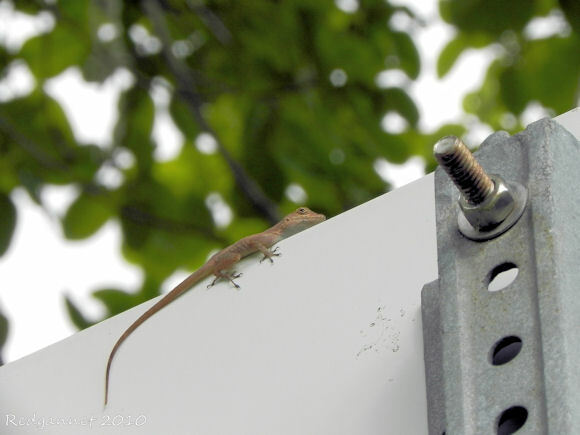 I have photos of Cuban Anoles from my previous visits, but I cannot say with any certainty what this one is. 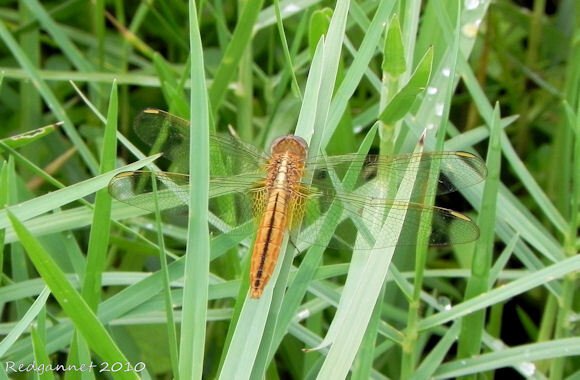 We are into November now and I was surprised to see so many dragonflies still about. Very few settled for me to get a good look at, but I suspect that many were Black Saddlebags Tramea lacerata and a few were Blue Dasher Pachydiplax Longipennis. 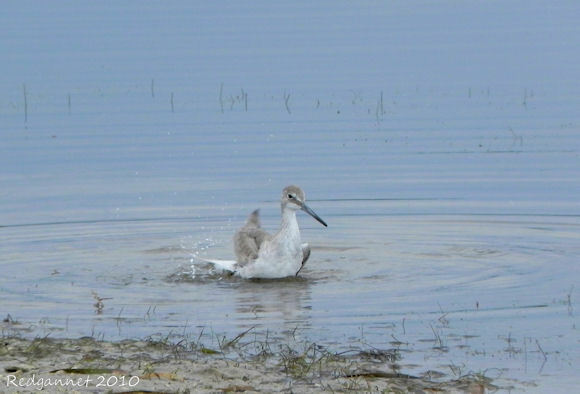 There are a couple of Miami posts for dragonflies on Redgannet (and plenty more besides. Come in, sit down, enjoy) if you would like to see some more. This is a female Crimson Darter Crocothhemis servilia which is an introduced species. Talking of which, introduced exotics are very common in Florida and especially in Miami it would seem. Is there a collective noun for alien species? I saw half a treeful of them as I cycled back to the hotel. The extravagant whistling from a Hill Myna caught my ear. I found two of them in a bare tree with Canary-winged Parakeets, Common Starlings and a Eurasian Collared Dove. Across the road was a White-crowned Pigeon and overflying, a flock of Red-crowned Parrots. It was like being in an ex-pat enclave. My colourful colleagues were there to greet me when I returned, wet, bedragled and very un-Mary Poppins-like to the hotel. They happily regaled me with their adventures which included meeting a California Thrasher and playing Whip-Poor-Will ’til the small hours. As an aside, a gay colleague once accompanied me for a birding visit to New York’s Central Park. He had never seen a woodpecker and was thrilled to find three different types that morning. He asked me not to tell the others that he had been birding with me. Despite being brave enough to come out as gay, he could not summon the courage to admit that he had been bird watching. So may I finish by commending you all for your backbone and I am looking forward to meeting you all at the Birders’ Pride Parade. Brown Pelican 6, Double-crested Cormorant 40, American Anhinga 1, Great Blue Heron 4, Great Egret 2, Little Blue Heron 6, Yellow-crowned Night Heron 1, White Ibis 35, Turkey vulture 60, Black Vulture 1, Osprey 1, Sharp-shinned Hawk 2, Broad-winged Hawk 1, American Kestrel 1, Common Moorhen 2, Willet 1, Ruddy Turnstone 15, American Herring Gull 1, Laughing Gull 60, Royal Tern 3, White-crowned Pigeon 1, Mourning Dove 4, Eurasian Collared Dove 4, Canary-winged Parakeet 50, Ruby-throated Hummingbird 1, Belted Kingfisher 1, Red-bellied Woodpecker, Yellow-bellied Sapsucker 1, Gray Catbird 3, Northern Mockingbird 3, Blue/gray Gnatcatcher 3, Blue Jay 4, American Crow 15, Orange-crowned Warbler 2, Black-throated Blue Warbler 2, Yellow-throated Warbler 1, Prairie Warbler 1, Palm Warbler 12, Northern Cardinal 5, Red-winged Blackbird 5, Common Starling 50, Hill Myna 2, Boat-tailed Grackle 40. Sounds like a great time birding. Six of those birds would be new birds for me in the U.S. and five of those would be lifers. I really, really, really need to bird Florida. And I love the lizard! Excellent post and excelent birds. 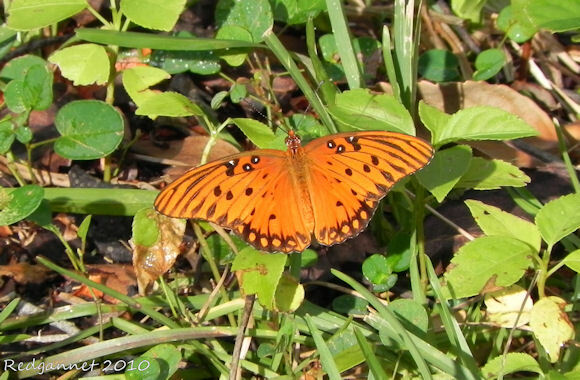 I have seen some of them in the Mangroves and Marshes of Ecuador. All those birds and no mention of Florida Scrub-Jay till the list at the end? You sir, have far more restraint than I! I have no restraint at all. My big downfall is chocolate. The scrub-jay was a mis-click compounded by a copy and paste from my listing software. Sorry to get you worked up like that. It should of course read Blue Jay. Hands up, well spotted. I shall correct it immediately. Ah ha! Too bad then, not that Blue Jay isn’t a nice bird in its own way. Man, this Broad-winged Hawk has some confidence in the sharpness of its talons. Well it doesn’t help that the field guides don’t carry much updated info on the parrots. There are many species that are far more numerous now than the ones in the book. These days in Miami, blue crowned, red masked and mitred conures and monks (parakeets) are the most common ones. Black-hoodeds are increasing quite a bit also. The ‘canary-winged’ which are expected(and once were in huge flocks), are actually much less widespread now. Red-crowned and yellow-headed parrots in Miami seem to have been replaced by the white-fronted and orange-winged parrots. I’ve been here for 18 years, its very noticeable the changes in species make-up. 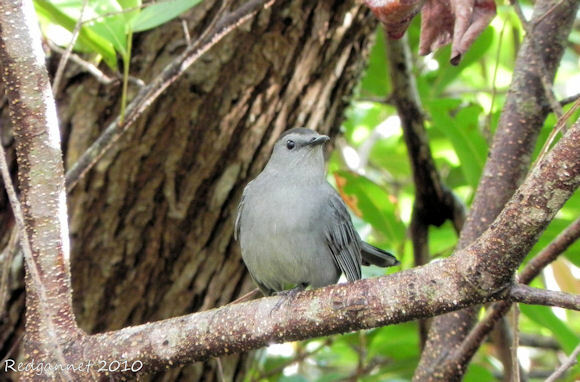 Always check the Tropical Audubon Society here. They are a dedicated bunch. Where Are You Birding This Final Weekend of September 2014?